Even on holidays I like to take pictures. This is the story of one of them. The fisherman’s catch. It’s the golden hour, early in the morning, when the warm sunlight casts long shadows on the little Greek fishing port of Poros. I notice cats gathering in small groups on the wharf, soon to be joined by passers-by. Like commuters on a platform, knowing exactly where the train is going to stop, they await the fisherman’s catch. 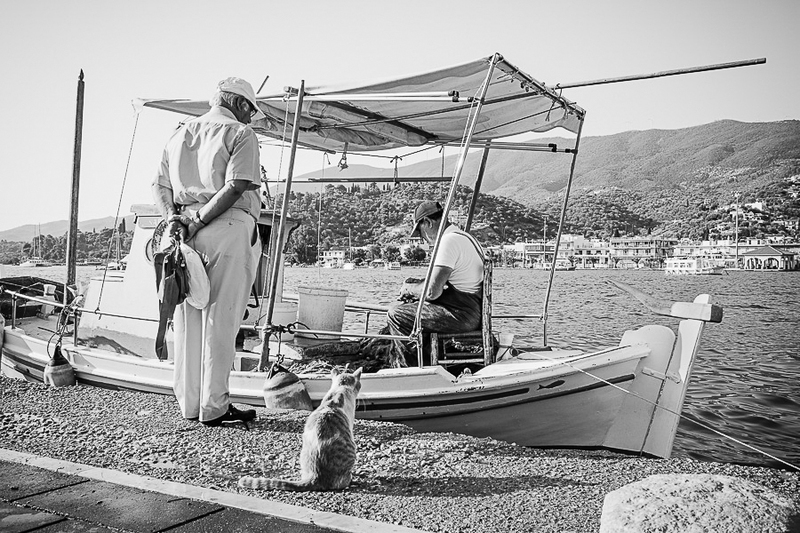 As the boats dock, the bartering beguines under feline scrutiny. The cats keep a sharp eye on the fisherman’s nets, they know that as soon as the fish undertake their final journey to the kitchens, the nets will be cleaned and they will get the pickings. Before my camera reaches my eye, the good one that is, the story is already complete in my mind. I know how the photo is to be cropped and I have also decided that it will be printed in black and white with a warm chlorobromide tone. I can’t stop myself. Everywhere I look there are photos to be taken. For me, photography is not just a passion. It’s my life!